Dr. Kressin is a dental specialist. He specializes in the identification & treatment of oral disorders in the pets we love. 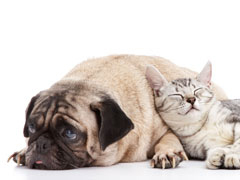 Dog Dentist, Cat Dentist & Vet Specialist - Pet Teeth Cleaning & Oral Care - fives days per week in multiple locations! You are an advocate for your pets, and dental care is an extremely important factor in protecting their general health! Consider low cost Oral Health Screening, Dental consultation and Preventative dental care for all of your pets now. Pets need dental care too! And its easier than people imagine! Veterinary dentistry is a very important aspect of animal health. Veterinarians have minimal training in dentistry from their veterinary college education. A human doctor (physician) has similar dental training to the veterinarian. These general practitioners are prepared to provide medical care and advice. They are dedicated to optimal health care for their patients, and therefore they will refer you to a specialist for specific services. The veterinarian may refer you to a veterinary dentist for dental care, as your physician would direct you to a dentist for dental care. Dr. Kressin is a veterinary dentist providing specialty dental care services. He works as a team with you and your veterinarian, for your pet. Dental care for pets is very similiar to dental care for humans. Nearly every dental service you may need or want, is available for pets (veterinary dental services). The primary difference is that anesthesia is necessary to perform these services safely and adequately. Fortunately, veterinary anesthesia is a priority in the training of the veterinary dentist (dental specialist), and a safety priority in the delivery of dental care. Dental care for pets starts with teeth cleaning, continues with home care by teeth brushing and the use of safe and effective products to help promote oral health.